One recent trend in wedding planning has been to incorporate various origami elements into the ceremony and reception. An origami wedding often appeals to the bride and groom who want to have a celebration that is memorable and unique. Handmade paper invitations, decorations, and favors give the wedding a personal and intimate feel. Another common reason for incorporating origami into a wedding is the financial benefit. With the price of the average wedding in the United States nearing $30,000, cash-strapped couples can save a bundle by folding their own invitations, decorations, and favors. 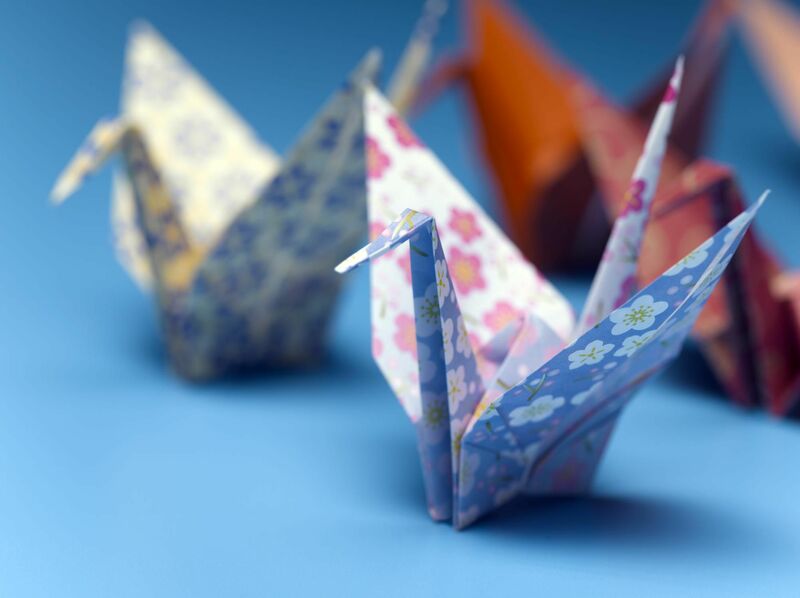 Origami cranes are a symbol of honor and loyalty. As detailed on About Wedding Traditions, they are often used as decorations at Japanese weddings. If you're getting married someplace other than a church, you could string together several long strands of cranes to hang from the ceiling to make a stunning backdrop for your wedding vows. Origami cranes would also make lovely wedding favors. You could decorate a table with them at your reception, then have each guest take a crane when they leave. Origami cranes are a great way to show off beautiful patterned papers, so feel free to fold cranes using many different patterns with the same general base colors as your wedding color scheme. Kusudama flowers are great decoration for weddings. You can make individual flowers for your tables or combine them to make large kusudama balls that you can then hang from the ceiling. If you're on a very tight budget for your wedding, this is a thrifty alternative to using real flowers for your decorations. If you don't have the time or the patience to make a large number of kusudama flowers, there are several people on Etsy who will make them for you. Graceline Paper Studio is one seller to check out. A bouquet of origami lilies is a lovely alternative to fresh flowers. The arrangement gives your wedding a unique look and can be enjoyed for many years to come. Hearts are a popular motif in many wedding decor schemes. 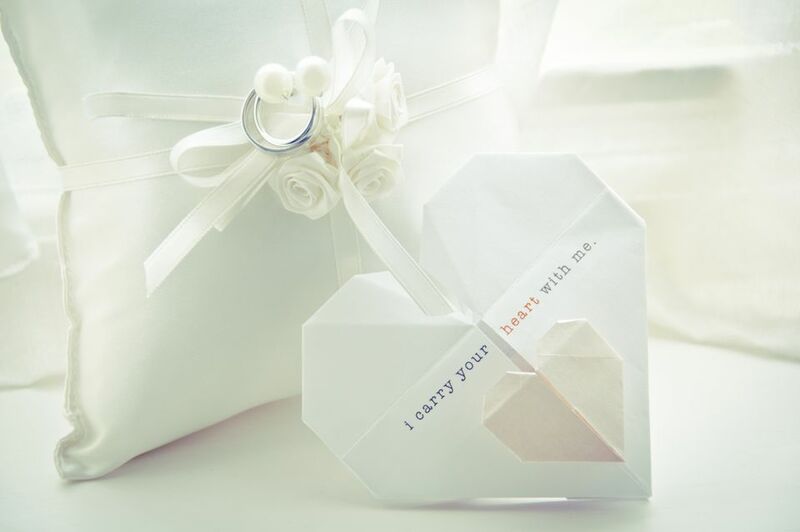 If you are planning to make your own wedding invitations, programs, or thank you cards, accent them with origami hearts. The hearts can also be strung together with ribbon to make a decorative garland. If you are the bookish type, hearts folded from the pages of old books can provide a wonderful decorative accent for your wedding. Put tiny silk flowers or rhinestones in the middle of each heart to provide a "pop" of color. Origami boxes are a pretty way to present wedding favors, such as wrapped chocolate hearts or tiny scented soaps, to your guests. Origami boxes are one of the easiest models to fold. Friends and family members are often eager to help plan for a couple's wedding. Even if your loved ones don't currently practice paper folding, there's no better time for them to learn! Have a party where you serve snacks and show everyone how to fold the models of your choice, then send them home with paper so they can work on folding favors when they have time. Jars filled with origami lucky stars make for pretty decorations for your reception area. If you're having trouble finding​ a paper that matches your wedding colors, this would be a good model to make using silver, gold, or bronze metallic origami paper. Every wedding always has their place cards! Instead of just laying them on a table or propping them up on a dish why not make a stand for them? Folded cloth napkins add an elegant touch to any meal, making them an excellent choice for your wedding decor. This origami rose napkin is simple to fold and adds a simple romantic touch. What Are Some Tips For Teaching Origiami For the First Time?